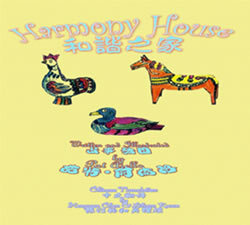 Harmony House tells the story of Emily, a little girl who is troubled by the fact that many animals have to kill each other to eat. She sets out on a quest to find a place where animals can live together in harmony. Though she is not completely successful, she does discover some important rules for living in peace with others, both in the human as well as in the animal world. Pat Ajello was born in London, England, and emigrated to Canada with her Canadian husband in 1960. She taught in Vancouver schools for several years, specializing in the teaching of Art. Since taking early retirement, she has written short stories, poems, memoir, etc. She has self-published several books for family and friends. She currently convenes a workshop, "Writers' Circle", at Brock House seniors' centre. Hongyun Chen (Ji Bei) was born in Linchuan, China, and graduated from Shanghai the Second Military Medical College in 1984. She came to Canada two years later and got her Ph.D. in molecular biology from University of New Brunswick in 1990. Afterwards she worked in two pharmaceutical companies as Senior Research Scientist and Director. She started her writing in 1995 and her essays, poems, and short stories have been published in Chinese and English newspapers both in North America and China. Her works have also been collected in Do You Know How to Love by Cacanadadada Press and anthologized in Under the America Sky by China Press, Selection of Contemporary Global Chinese Poems and Prose by Tianya Literature Press, etc. Some of her writings also won prizes in the United States. Harmony House is her first translation work.